Jessica joined Watsi on April 1st, 2014. Five years ago, Jessica became the 99th member to automatically support a new Watsi patient every month. Since then, 4,993 more people have become monthly donors! Jessica's most recent donation traveled 8,700 miles to support Ajira, a girl from Tanzania, to fund surgery to help her breathe. Jessica has funded healthcare for 58 patients in 10 countries. Anny Sanic is a very enthusiastic and fun four-year-old girl from Guatemala. She lives with her mom and dad and loves to play with her dolls. She also loves to eat lots of bread and sing songs. Anny Sanic needs pterygium correction surgery. Pterygiums are non-cancerous growths of the conjunctiva, a mucous layer that lubricates the eye. The growths occur when the conjunctiva is exposed to excessive sun damage and the cells grow abnormally over the pupil. Common symptoms of a pterygium include redness, blurred vision, and eye irritation. Depending on how large the growth is, it can cause vision loss. Anny Sanic needs a surgical procedure to remove the abnormal conjunctiva from the cornea surface and replace it with a conjunctival graft to prevent recurrence. She will receive further evaluation from an eye specialist, surgery to remove the pterygium, post-op follow-up treatment, as well as accompaniment and transportation throughout the treatment process. Pterygium surgery is safe, effective, and will positively impact Anny Sanic's life for years to come. The total cost of her procedure, scheduled for October 18, is $1,487. Ma Myint is a 40-year-old woman from Burma. She works as a masseuse, and sometime she helps at the monastery by cleaning and preparing food for the monks. Since July of 2017, Ma Myint has been experiencing abdominal pain, back pain, and discomfort when walking. She has been diagnosed with an ovarian cyst. She has been advised to undergo a total abdominal hysterectomy, the surgical removal of her uterus and cervix. If left untreated, Ma Myint's symptoms will continue to worsen and put her at risk for further health complications in the future. Fortunately, Ma Myint is scheduled to undergo her hysterectomy on August 28. Our medical partner, Burma Children Medical Fund, is requesting $1,500 to cover the total cost of her procedure and care. Once recovered, Ma Myint will no longer experience abdominal pain or back pain and she will be able to return home and work again. “I’m always thinking and worrying about my condition and I’m not able to sleep well,” says Ma Myint. Arnold is a young student from Haiti. He lives with his mother and older sister in a neighborhood of Port-au-Prince. He has Down syndrome and goes to a school for children with special learning needs. He has many friends and enjoys helping his mother around the house. Arnold has a cardiac condition called partial atrioventricular canal defect. Holes exist between both the upper and lower chambers of his heart. Blood leaks through these holes before first passing through his lungs to obtain oxygen, leaving him sick and short of breath. Arnold also has a condition called pulmonary hypertension, in which the blood pressures to his lungs are too high. For this reason, he needs a diagnostic catheterization to determine whether it is safe for him to have surgery. 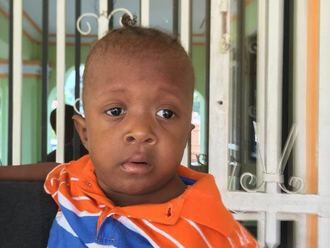 To determine if Arnold's condition is operable, he must undergo a diagnostic cardiac catheterization, a procedure that is not available in Haiti. During the procedure, a catheter probe will be inserted into his heart to perform the necessary measurements and tests. On August 22, he will travel to the Dominican Republic to receive the scan at our medical partner's care center, Clinica Corominas. Our medical partner, Haiti Cardiac Alliance, is asking for $1,500 to cover the costs of Arnold's travel expenses, catheterization procedure, and lab work. His mother says, "We are all praying that Arnold can have surgery so that he will be more healthy and have more energy." Esther is a pre-school teacher from Kenya. She is a mother of three children. She is the sole provider for her three children. In February, Esther decided to attend a free cancer screening camp, where she was unfortunately diagnosed with cervical cancer. She needs to undergo a hysterectomy, a procedure in which surgeons will remove her uterus. Our medical partner, African Mission Healthcare Foundation, is requesting $756 to fund Esther's surgery. On July 5, she will undergo gynecological surgery at our medical partner's care center. Once recovered, Esther will be able to resume her daily activities free of pain. Esther says, “I wish that soon I will be treated and return to my job. I miss the children I teach in the school." Tukahirwa is a small-scale farmer from Uganda. Her husband passed away in 2000, leaving her with two children. For three years, Tukahirwa has had a bilateral inguinal hernia. This hernia causes her pain and discomfort. If not treated, it may result in intestinal tissue damage and blocking. Fortunately, on April 10, she will undergo hernia repair surgery at our medical partner's care center. Our medical partner, African Mission Healthcare Foundation, is requesting $219 to fund Tukahirwa's surgery. Once completed, this procedure will hopefully allow her to live more comfortably and confidently. Tukahirwa says, “I hope to get a better lifestyle after surgery and continue with cultivation." Joseph is a motorcycle taxi operator from Kenya. He is a father of two children. In November 2017, Joseph was ferrying a client on his motorcycle when he was involved in a road accident. He fractured his right tibia and had a cast put on the fracture. Since then, he has not managed to get further treatment. He is unable to walk without assistance and is in pain. Fortunately, surgeons at our medical partner can help. On May 15, Joseph will undergo a fracture repair procedure, called an open reduction and internal fixation. This procedure will help him walk easily again. Now, our medical partner, African Mission Healthcare Foundation, is requesting $1,451 to fund this procedure. Joseph says, “My wish is to be able to go back to work and provide for my young family." Martin is a young student from Kenya. He wants to become a pastor. He is in sixth grade and has four siblings. Martin was diagnosed with cryptorchidism, a condition in which one or both of the testicles remains undescended. If left untreated, Martin has an increased risk of developing hernias, testicular cancer, and fertility problems in the future. Martin will be receiving assistance from our medical partner, African Mission Healthcare Foundation (AMHF). Fortunately, he is scheduled to undergo corrective surgery on January 29. AMHF is requesting $535 to cover the total cost of his procedure and care. “I want to be a pastor when I grow up,” shares Martin. Marvens is a toddler from Haiti. He lives with his mother and older sister in a neighborhood of Port-au-Prince. His mother is currently seeking employment. Marvens has a cardiac condition called atrial septal defect and pulmonary stenosis. Marvens was born with a hole between the two upper chambers of his heart, as well as one of the four valves of his heart that is too small. These conditions combine to make his heart work too hard to pump blood to his body, leaving him sick and short of breath. Marvens also has Down syndrome. Marvens will fly to Cayman Islands to receive treatment. On February 2, he will undergo cardiac surgery, during which surgeons will use a catheter to insert a device into the hole in his heart to close it, and will also use a balloon to stretch his valve open. Another organization, Have a Heart Cayman, is contributing $14,000 to pay for surgery. Marvens's family also needs help to fund the costs of surgery prep. The $1,500 bill covers labs, medicines, and checkup and followup appointments. It also supports passport obtainment and the social workers from our medical partner, Haiti Cardiac Alliance, who will accompany Marvens's family overseas. His mother says, "I will pray for God to bless everyone who is helping Marvens get better!"